It used to be that every TV antenna used a 300 ohm feedline. It was 300 ohm twin lead. It was cheap and the lowest loss feedline you could get. The only problem it had was that it picked up noise. In an analog system noise shows up on the screen. To get rid of noise TV feedlines were changed to coaxial feed lines. These were shielded and pretty much eliminated noise. Digital TV does not show noise on the screen. All it needs is a minumum signal level. Once that signal level is met you get a perfect picture. No noise, no ghosts, no aberrations, just a perfect picture. So now I am going back to 300 ohm twinlead and dumping the coax. Less loss in signal from the antenna using 300 ohm twinlead and it is much less expensive too. This is an Andy Rooney like rant about telephone service. Well, we finally got a MagicJack and got it working. It helps to have a computer that works and has an active connection to the internet. After fooling with an improperly configured computer for a day we discovered that the installation, registration, and email verification process only takes a few minutes. The instructions ask you to allow a couple of hours. We bought our MagicJack locally. Saved about 7 bucks shipping and handling. The local sales guy said we could change the telephone number. MagicJack says you can’t do that yet. Maybe later. Later is too late. Once I nuke my Vonage connection my old number will be history and I am not interested in paying someone to retrieve it. Moral, read the fine print, don’t listen to the sales guys, they are not going to tell you the downsides and most likely will embellish the upsides or create upsides that don’t exist. We were fine with Vonage, sort of. We opted for the Vonage 15 dollar a month plan. A few months after that they bumped the fee up by three bucks. Last month the charge with taxes included was around 23 dollars. Not sure what they hope to gain by not including taxes in the service charge when they sell the service. Some would consider that a scam and false advertising. The only thing the consumer is going to care about is total cost. We all know it sounds better to claim the service only costs 15 dollars a month, but when you end up paying 23 instead of 15 dollars you might have made a decision not to participate before you found out that the 15 dollar fee was ficticious. Oh well, no real harm done. All things considered we would rather pay $43 dollars for a YEAR of phone service including call waiting, caller ID, voice mail, unlimited local and domestic long distance service, than pay an initial 80 some bucks to get started and then 23 a month forever. The basic charge for Vonage is currently 17 dollars with 3 of that going for Vonage greed. Lets see that is 3 dollars every month or 36 dollars a year because Vonage thinks they are worth that. But wait, that is not all, I also get to pay some do nothing tax collector 6 dollars a month for the priveledge of even having a telephone connection. Not sure why the goberment has the right to screw me out of money for a service they have nothing to do with. That is another 72 dollars a year I get to pay for taxes that will never do me any good. So, by dumping Vonage I get to save 108 dollars a year which I was being charged for just being here. That is not quite as good as what I saved by dumping ATT in favor of Vonage but it is another step in the right direction. Not just that, but I feel really good about not paying those taxes and letting Vonage know I don’t care for service charge increases. Who do they think they are, the cable company? Another downside to Vonage that is neatly avoided by magicjack is the credit card number thing. I just don’t feel comfortable with some vendor having access to my credit card number to charge my account whenever they see fit. Yes, we can watch the charges and correct those which are unjustified, we can also use a debit card, but we have better things to do than babysit an account that is open to abuse. If they don’t have the account number they can’t charge to it and we don’t need to keep an eye on it. Keep it simple and you have more time to enjoy life instead of agonizing over some moron possibly charging you for things you don’t want or need. As I recall that is the real reason we dumped the ATT land line. They were charging us for caller ID that we did not want. They removed the charge when we complained, but reapplied it the next month. I guess ATT has been around long enough to begin suffering from alzhiemers but I don’t have to suffer with them. We just could not get them to understand the concept that they were working for us, not the other way around. Thanks to Vonage we were able to fire ATT. MagicJack is a one time cash transaction. Covers you for one year. Not sure what happens after that. Guess I will have to renew the service and it will most likely cost more than 20 bucks. Oh well, by then we will probably be looking at magicjack two, or magicjack three, or superjack one. MagicJack is too large a big deal moneymaker not to have others compete for the profits. Over time there will be more and more people looking for phone service of this kind. Especially if ATT keeps making their customers mad. Time will tell. Time also informs me that paying in advance for anything more than a year out is foolishness. MagicJack advertized a purchase price of $39 for the jack and one year of phone service. That does not include shipping or tax. If you can find a local vendor and a way of getting there, it will cost you $43. The extra bucks are tax, sales tax. You will also be given the opportunity to buy into some sort of super service agreement to cover your magic jack for the next ten years. I believe that is another 5 dollar charge. Sucker bait. I would be very surprized if the magic jack was still around after one year without some sort of change. Then all that ten year service thingy gets you is someone telling you that your magic jack is obsolete, no longer supported because it has run out of magic. No thanks. 911 is a big deal, evidently. If you use non-landline phone services the 911 central office cannot be sure of your location. I can see that is a big deal if you can’t tell them where you are and still need help. I figure if you can’t talk to them you might not even be able to dial 911 in the first place. It is my belief that automatic location identification is more of a benefit to the 911 service than the caller. Allows the 911 folk to hire people who don’t speak english or even employ automated answering ‘services’. I sort of like the idea that people who I call don’t necessarily know where I live until I tell them. Keeps you from getting annoyed for no reason. So now we are testing the magicjack. Not sure how good the test is going to be. No one has our new number. We don’t want to give it out until we are sure we want to keep the magicjack. Sort of like which came first, the chicken or the egg. Our Vonage connection has started giving us problems. Nothing serious. Just some dropouts during a phone call. Evidently the dropouts were only noticed at our end. The party on the other end never noticed any problems. So far the magicjack has not introduced us to any dropouts and the audio quality is very good. Perhaps at the end of this month we can do a final dropout to Vonage. Have we learned anything? Lets see. MagicJack seems to be the way to go. Trust but verify and don’t believe sales hype. Finally, If I have a non-telephone associated internet connection and email capability, why do I need a telephone service? Well, for $43 I have bought myself another year to find an answer to that question. This tube amp is something suitable for use as a small computer speaker amp. Inspired by the recent discovery of the Morgan amp. The Morgan amp is a simple three tube single channel amp using old AC/DC 5 tube radio parts. A 50L6 output, 35Z5 rectifier, and 12SQ7 pre-amp all cobbled together to give at least an honest 1 watt of audio to a pair of simple speakers. Cheep, cheap, inexpensive. The Morgan amp runs directly off the 120vac line. Not a safe application, but it can be made safe by using an isolation transformer, fuse, and on/off switch. The low cost is a direct result of the simple design. I did not have but one 35Z5 but I did discover a few 12AV6s, 50C5s, and 35W4’s. These are the miniature equivalents to the tubes used in the Morgan amp. So I decided to use them in an updated Morgan design. The only change was to replace the tubes with the ones I had on hand. Folk who do not have a box of parts to pick from can still build this amp. The most economical approach is to find two AC/DC radios at a thrift shop or garage sale. Working or not, these radios can provide all the parts necessary to build a two channel Morgan amp. Three of the tubes in these old 5-tube AC/DC radios are used in this amp. One of the remaining tubes is an IF amplifier and the other is a mixer. In my design I used the goofy printed circuit mounted tube sockets found in the AC/DC radio I had. I simply cut them out of the old printed circuit board and mounted them with screws to a scrap of unused printed circuit board I had been saving. Somewhat more work than it should have been but very effective. The housing for the amp was made from scrap pieces of redwood that had been salvaged from a demolished redwood deck. The complete enclosure is redwood and plexiglass. The plexiglass is also of the salvaged variety. The end result is lots of noise for little cost. Actually no cost except for the time to build the thing. ten dollars but then they are ten dollar amplified computer speakers. They don’t have the characteristic sound of a tube amp. What characteristic sound? The sound of rock and roll. All this started when tubes were cheap and amps were popular. Folk were not too concerned about how linear the sound was. Or how well a full spectrum of sound frequencies were replicated. All they wanted was something to make noise. Meanwhile, tube amp designers were not all that concerned about building expensive stuff with super good specifications. Why bother when it cost much less to build something that just made a lot of noise. Besides this is what was selling. No future in building stuff no one would buy. It was much easier to sell a cheap tube amp than a more expensive carefully engineered amp. The rock and roll crowd picked up on the cheap amps and used them. Their cheap and distorted audio gave the music a distinct flavor and rock and roll was born. Now days real rockers can appreciate the sounds of that distinctive distortion that you can only find in music coming from a poorly designed tube amp. So here you have it, a poorly designed tube amp for the rock and rollers. You don’t have to dream about it. You can actually re-live the past. At least listen to the music of the past on real tube equipment. When you can do it for no cost, why not? Two years ago I began building ‘STUFF’ out of cedar. I found that I could buy an eight foot, rough cedar, 2X4 post at Home Depot for about $5.50. Once I got the thing home I would cut it up on the table saw into 2 inch by one inch 8 foot sections. I trimmed off the rough sides, cut out any knots and imperfections, glued some of the pieces together to make 2X2 inch posts or six inch square sections 2 inches thick or any other size that came to mind. I liked the way plain varnish darkened the cedar and brought out the beauty of the wood without need for stain. I began building floor lamps and desk lamps. Each made from 100 percent cedar, even the shades. Those very thin trimmed rough sections ended up making perfectly good lamp shade material. Recently I came into possession of a small table lamp that was a touch on, touch again to make brighter, touch a third time to make brightest, and touch again to turn off. It soon became one of my favorite lamps until recently the touch mechanism quit working. Touch it as you may it remains on bright. After I could not get the base appart, I gave up on this six dollar thrift shop item. I retired it to temporary spare computer service. The shade attaches to its light bulb with a wire hoop. I turn the hoop clockwise, seating the bulb to turn it one. Turn it counterclockwise, unseating the bulb to turn it off. It never had a real on/off switch. Just the high tech touch on/bright/off function that quit working. Now it has a really low tech but effective way of turning it on and off. Very primitive but not as bad as unplugging it and plugging it back in. Now I needed a replacement. Several months ago we replaced eight 100watt ceiling mounted wall washer spots with compact flourescents. The first thing we noticed was the new compact flourescents do not work well with incandescent dimmers. The dimmers were replaced with ordinary switches. Not wishing to discard perfectly good incandescent dimmers, I decided to use one to invent an new desk lamp. One that had a dimmer feature. I used my fostener bit assortment to hollow out the base of one of the desk lamps. Then I mounted the dimmer inside the hollowed out recess and glued it in with hot melt glue. Got it wired up and presto, a nice incandescent desk lamp with dimmer. Works great and is a near perfect replacement for that touch lamp that failed. Ah, toy trains. I remember my first toy train. It did not need a table. The three rail metal track was layed out on the floor and the engine was powered by an electric motor. This train does need a table. The track is made of wood as is the train and it is powered by the little hands of a two-year old. A nice train table and two storage boxes– were priced at $300. I thought that was way too high until I started building it. Building it yourself saves more than half the cost but after the rubber feet bumpers, casters, chalkboard paint, varnish, wood and miscellaneous materials were purchased we were $90 lighter in the pocket. Before you rush out and spend money on materials be sure you have all the tools to build this project. At a very minimum you will need a table saw and belt sander. It is assumed you also have the normal assortment of hand tools. Electric drill, drills, screwdrivers, paint brushes, hammer, nails and so forth. You would do well to see about gaining access to a drill press to drill the holes through the legs. The legs need holes for screws. This allows you to break down the frame for transport or shipping. 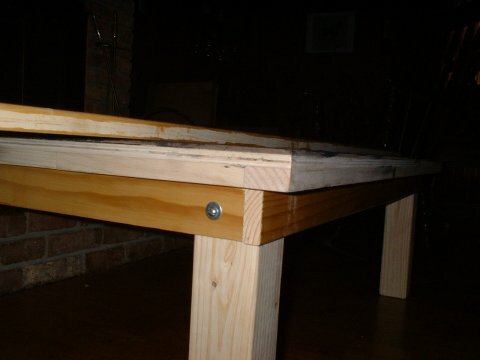 If you are going to use the table where you build it, or have a truck, it would certainly be possible to avoid the holes and screws and permanently mount the legs. Chalkboard paint? Chalkboard paint is fairly common and makes a reasonably good chalkboard. 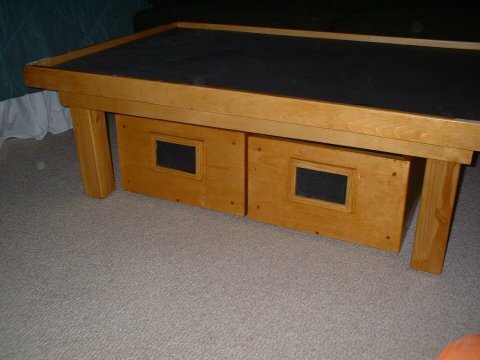 We wanted the top of the table to be a chalkboard so that it could serve a double purpose. I have also heard that you can make your own chalkboard paint. Here is a link that tells you how to do it. Table top inside dimensions are 48 X 32 inches. This is the dimension of the top itself, before it is framed. The skirt keeps little train parts from falling to the floor. The top dimension is sized to allow colorful landscape posters to cover the top. Makes the train layout look more natural. Here you can see the bolt holding the end piece to the table leg. That is chalk on the chalkboard top. One of the ways of conditioning the blackboard is to cover it with chalk after the paint has cured for three days. Rub chalk all over it. Let it sit a few minutes. Then erase the chalk with a clean, damp rag. This was done before the final trim was installed around the table top. 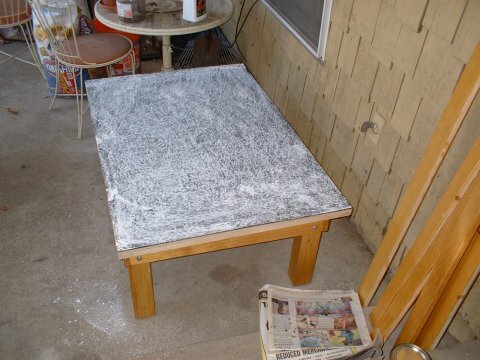 I have not figure out yet how to remove the chalk dust from the patio. I suspect a garden hose will be involved. See the prevarnished lumber leaning up against the wall? That is the skirt material that will be installed around the table top. It is prevarnished so that we dont slop paint onto our blackboard top. Notice also that the skirt material is clear pine. No knots or imperfections. We cut that wood from a larger pine board on the table saw and discarded those parts that had knots. That is far less expensive than buying clear pine. The chalkboard paint was also used on the storage box covers. So you can either sit on boxes with covers in place or draw on them with chalk or remove the covers and draw on them. Lots of possibillities. The table legs are 3×3 inch pine and were made from two joined lengths of 2×4. The leg assembly is in four sections. Two of the sections had legs securely attached with glue and dowels. These two sections were fitted to the skirt framing the underside of the table top. Two additional end pieces are attached with bolts and T-nuts. The attachment can be seen in the pictures. A 1/4 inch diameter, 4 inch long bolt passes through the end skirt, through the leg and is screwed into the threaded T-nut that is installed into a hole in the far side of the leg. These holes almost have to be drilled on a drill press to keep them straight and true. The wood is pine. The actual table top is hardboard that has had three coats of blackboard paint applied. The painted top is glued to a sheet of half-inch thick plywood for support. The finish is Minwax Honey Pine Stain & Polyurethane. I did not even think of painting the plywood directly with chalkboard paint. My guess is that would not make a very good blackboard. The surface of my plywood was too rough and soft. The hardboard is VERY hard and the finished side is VERY smooth. Excellent blackboard material. 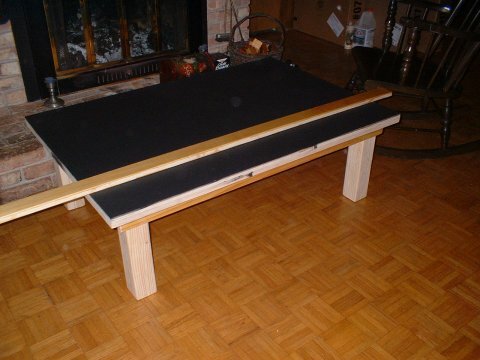 The hardboard blackboard is attached to the plywood with glue alone. Some clamping helps but I did not have the clamps required to seriously hold the parts together and had to rely mainly on gravity and some heavy concrete blocks. Storage boxes are made from pine shelving. Mitered corners glued and held secure with dowels and more glue. Bottoms of the boxes are hardboard riding in a slot cut into the end and side boards before assembly. 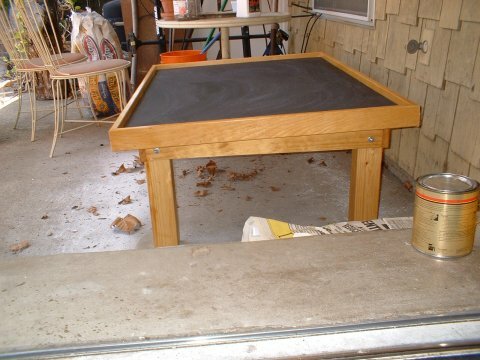 Tops covers are hardboard that has also been painted with chalkboard paint. I saw a demonstration of the new Tickle Me Elmo doll on Good Morning America yesterday. They sent him through all three levels of hilarious laughter. Very impressive! Suggested retail price is under fifty dollars. I predict the price will double, perhaps triple and more depending on how close you are to December 25 this year. A word to the wise, if you are considering purchasing one of these dolls, make sure you buy plenty of batteries. Those hatches at the bottoms of both of his feet are battery access hatches. I suspect he takes D cells and more than just one per foot. Ooops, my mistake. He takes six AA batteries. I bet they need frequent replacement. If you have any money left over this season (HA!!! ), you might also buy some stock in a company that manufactures batteries. Battery disposal companies might also do well. As a parting thought, speculators might want to load up on a few of these dolls before parents have a chance to clear the shelves of stock. I bet a genuine doll will bring big bucks after the cheap knock-offs start shipping from some place in China.